Proxicast's professional grade X-BOOM antenna mast crossover bracket kit allows you to mount a horizontal pole to a vertical mast or to add a vertical mast to an existing horizontal railing. The bracket securely mates the poles at a 90 degree right angle. This bracket is designed to support most 3G/4G/LTE, WiFi, Television, Direct TV, Dish Network and 900 MHz ISM antennas. • Installing antennas on water tower "painter rings"
The X-BOOM's one piece construction with V-notched pole guides simplifies installation, securely clamps the poles into place and reduces vibration. The plate's size and hole placement design makes it easy to access the U-Bolts even when both poles are in place. All components are pre-galvanized for corrosion protection and reliability even in extreme environments. The extra thick plate will not bend or deform under normal conditions. 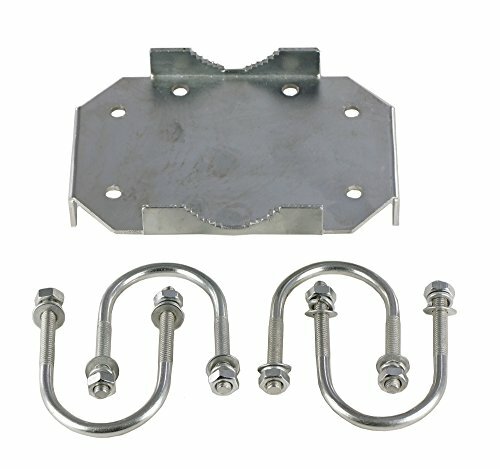 Each kit includes one (1) plate and four (4) U-Bolt assemblies. Antenna masts are not included.